The ecommerce giant is investing in R&D operations in East Anglia's tech hub. As MT noted yesterday, Apple's reported plans to open an R&D centre in Cambridge would leave it in good company. 'Silicon Fen' has a much lower media profile than London's Silicon Roundabout, yet it also has a much better established high-tech pedigree that stretches back decades. Now it seems that Amazon wants in on the action. 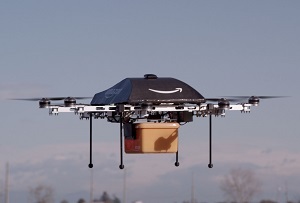 The ecommerce giant is planning to expand its own R&D facilities in the city and is looking to hire specialists in aviation technology as it develops its automated delivery drones programme Amazon Prime Air, Tech Crunch reported. The drones, first announced last year, were initially written off as a publicity stunt by some and many still expect the plans to come to nothing, but this latest expansion is a sign that Jeff Bezos is taking the idea very seriously. It's easy to see why – one of the few parts of its supply chain over which Amazon now has little control is delivery, which is usually completed by local postal services or couriers. But given the technological and logistical complexity and the regulatory issues involved, MT doesn't anticipate seeing a sky criss-crossed with flying barbecues anytime soon. Amazon is also advertising more jobs at Cambridge-based subsidiary Evi which it acquired in 2012. The startup developed an artificial intelligence app similar to the iPhone's Siri and is now looking for software developers and quality testers as it expands. Amazon is thought to be keen on developing the technology to make more of its devices voice activated and streamline the shopping process. The behemoth has come a long way from just being a website where you can buy books and it continues to expand into new markets and develop new retail technology. It's been experimenting with click-and-collect lockers in shops, petrol forecourts and train stations and in the US it's also moved into fresh grocery deliveries - watch out Tesco. There's even murmurings that it could be planning to open a full-on bricks and mortar shop, perhaps the most revolutionary move such a digitally-orientated company could make. Do you believe Elon Musk's vision of the future?